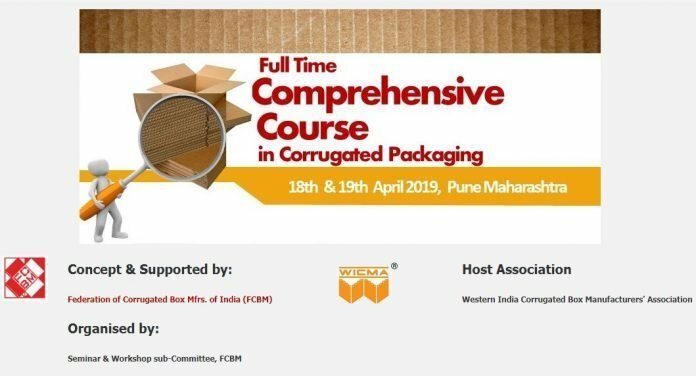 The Federation of Corrugated Box Manufacturers of India (FCBM) in association with Western India Corrugated Box Manufacturers’ Association will organize a 2-day full time comprehensive course in corrugated packaging at Auto Cluster Development & Research Institute, MIDC Chinchwad, in Pune on 18 and 19 April 2019. Chairman of FCBM Seminar & Workshop Sub-Committee, Ramkumar Sunkara, Co-Chairman, Amit Jain along with faculty members Sanjay Bothra and Bhaskar Reddy will impart training on corrugated packaging to the participants during the program. The participation fees for FCBM members will be Rs. 3000 plus GST @ 18%, while non-FCBM members can pay Rs. 5000 plus GST. For group registration, a discount of Rs. 500 per participant is offered. Cheques/DDs can be drawn in favor of Western India Corrugated Box Manufacturers’ Association, payable at Mumbai. 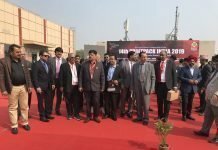 Aspiring participants can also make RTGS / NEFT payments in favor of Western India Corrugated Box Manufacturers’ Association. Savings A/c Number: 04120100010211 – Bank of Baroda, Sakinaka Branch, MICR Code: 400012057 – IFSC Code: BARB0SAKINA. The carefully chosen topics covered in the course are relevant to the needs of the industry. The course has been organized in nine other regions and has proved to be extremely popular. Participants will be provided with a reference book and course material and every presentation/subject in detail, which will be valuable reference for the future. Upon successful completion of the course, the candidates will be presented with certificates. The 2-day comprehensive course will include subjects like latest trends in packaging for the next decade, properties of paper required to achieve specific performance standards of corrugated board, fundamentals of starch adhesives – technical, fundamentals of adhesives – management perspective, printing of corrugated board, properties of liners, properties of medium, properties of subtrate, inks and plates for flexo printing, factors affecting compression strength of boxes, determination of compression strength requirement, determination of paper grade required to achieve the required compression strength, small automation in semi-auto plant for productivity, inventory management, and shrinkages of paper – reasons, impact on dimensions and remedies.